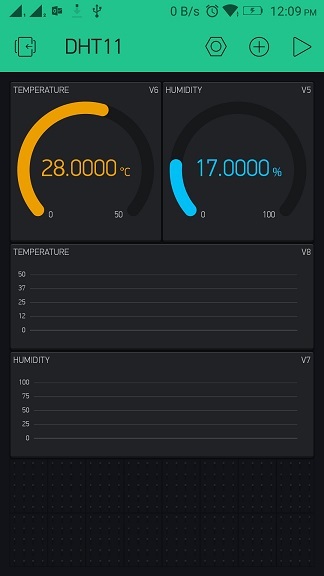 The NodeMCU collects the temperature and humidity from DHT11 sensor and sends it to Blynk app every second. Wow! Now that we have gathered all the stuff we need. Let's connect them. D4 pin of NodeMCU connects to pin 2 of DHT11. 3V3 pin of NodeMCU connects to pin 1 of DHT11 & GND of NodeMCU to pin 4 of DHT11. 4K7 ohm resistor connected between pin 1 and pin 2 of DHT11 sensor. Connect power(3.3V) to NodeMCU to make it work without USB cable. Before we dive into the code, let's setup the Blynk app to receive the data from NodeMCU. Create a New Project in BLYNK app. Write Project Name and Select NodeMCU from dropdown. An AUTH token will be sent to your registered email, note this down. Tap on the screen and add a 2 Gauges and 2 Graphs. Tap on the Widget and select the respective Virtual pins for temperature and humidity data(V6 and V8 for temperature and V5 and V7 for humidity). Note: Make sure to setup Reading rate as '1' second for all Widgets. And add gauges and graphs for both Humidity and Temperature. Make sure to download the below mentioned libraries, because missing out any of it will cause compilation issues, and we don't want that. Update the Blynk AUTH ID, WIFI_PASSWORD and WIFI_SSID in the code. Connect NodeMCU to computer using MicroUSB cable and upload the code. Click play button on top of your app and see your room temperature(degree celcius) and humidity(percentage) updated every second. Oh yeah! That's it for now, Sailors. See you in the next awesome IOT project. Great research and development on humidity meter. 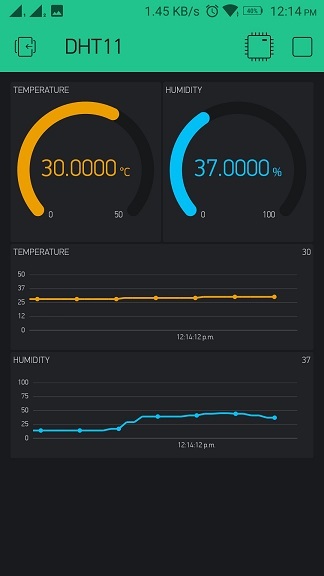 You can also see the best wifi temperature sensor by Ubibot.